For complimentary tickets, use the promo code BetaKit_FM. 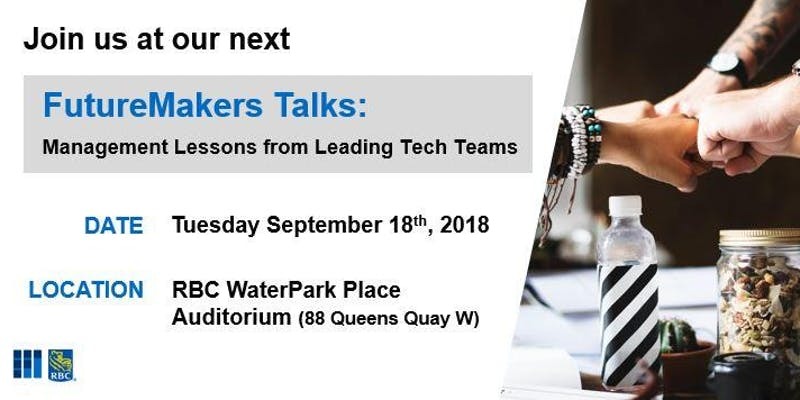 Come out and join us for an evening of networking, refreshments, and thought-provoking discussions on how to manage high performing tech teams. This edition of FutureMakers Talks will cover the tools and knowledge for managing all types of tech teams found at a large organization to a startup. The speakers will share their candid stories and lessons learned. The path to leadership informs the manner in which we lead and manage, and the transition from a senior development role to leading a team of developers is not a bright line. This talk will examine the experience we gain as developers that helps and influences leadership, and the lessons learned from the experience. Yang will discuss his role at StackAdapt and how it has evolved from being the only technical person on the team to leading a team of various engineers, PMs, and data scientists. He will touch on lessons learned on how to effectively build an effective team that keeps innovation up at a fast pace as it grows. Realizing that the last thing your team needs is you is humbling and requires you to realize the value proposition, you as a leader, bring to an agile team is not a top-down supervision and micromanagement, but vision positioning to set the expectations, and roadblock removal so that the team can meet them, and the best job you can do is predicting and smoothing the path before your squads have to ask.